Sunderland boosted their Premier League survival hopes as they ended a run of five straight defeats with a win over bottom side Aston Villa. The hosts took the lead against the run of play when Patrick van Aanholt's low 20-yard shot deflected wickedly off Micah Richards and into the net. A brilliant acrobatic volley from Carles Gil levelled after the break, before Jermain Defoe's low strike. Defoe added a late third, leaving Villa with no wins in 18 league matches. The biggest match of the season? Sunderland boss Sam Allardyce described the match as the "biggest of the season" and his players looked to be affected by nerves as they let Aston Villa dominate early on. The Black Cats went into the game seven points adrift of safety, and you could see why as they continually gifted the visitors possession. Only Vito Mannone's low save from Jordan Veretout kept things level until, against the run of play, Van Aanholt's shot deflected off Richards to leave goalkeeper Brad Guzan wrong-footed. The hosts knew only a win would do and, after Gil's stunning equaliser, Defoe stepped forward to give the Black Cats new hope and move them to within four points of safety. Defoe has now scored eight Premier League goals against Aston Villa in his career but there can have been few as important as these two. 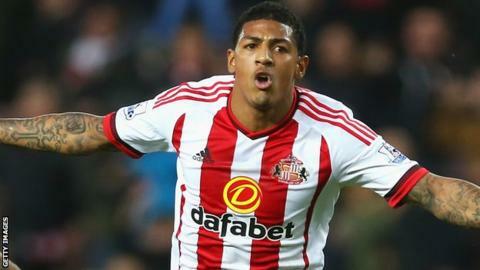 The Sunderland striker was on the periphery of things for the large part but, when given the opportunity, he showed his ruthlessness in front of goal. The former England man had four shots in total. He hit the target with three of them, scored twice, and had a late goal disallowed for offside. How Aston Villa could do with such clinical finishing. There are few - if any - signs of encouragement for Aston Villa, who look doomed to life in the Championship next season. While there are still 54 points to play for, a club record 18 league matches without a win is hardly the form to suggest they are capable of any 'great escape'. They produced some nice football at times but seemed short of confidence in attack. Aside from a brilliant equaliser, the closest Villa came to scoring was Veretout's first-half effort as they finished with just three shots on target. Having scored only 16 league goals this season - the lowest total in the top flight - Villa remain 11 points from safety. Sunderland boss Sam Allardyce: "I was very pleased with everyone holding their nerve, fans included. When Villa scored we could have gone under. But we kept it tight at the back. "You need anxiety to play football but if it goes too far into fear you can lose your nerve. When you're confident, things come naturally. But when you want to take an extra touch or an extra second to pass, with that fear, you give the ball away. The only way to dismiss that fear is to win games. "Thank God for Jermain Defoe and his finishing qualities. He turned the game back in our favour." Aston Villa manager Remi Garde: "I'm going to try [to sign players]. In life and football you have to believe - if you don't you have no chance. But it's more and more difficult. "But every season in every league, a side can keep losing and suddenly win four, five or six in a row. But for that probably we will need to bring in one, two or three new players. "Today I didn't see a side who didn't give everything they could. When you concede so many goals it's difficult to win games. You cannot be positive when you lose. I'm not here to lose - I'm here to try to make the team win." Sunderland have a trip to Arsenal in the FA Cup third round on Saturday, before playing at Swansea in the Premier League on 13 January. Aston Villa travel to League Two Wycombe in the FA Cup on Saturday before a home league match against Crystal Palace on 12 January. Match ends, Sunderland 3, Aston Villa 1. Rudy Gestede (Aston Villa) is shown the yellow card. Second Half ends, Sunderland 3, Aston Villa 1. Lee Cattermole (Sunderland) is shown the yellow card. Offside, Sunderland. Lee Cattermole tries a through ball, but Jermain Defoe is caught offside. Ola Toivonen (Sunderland) wins a free kick in the defensive half. Goal! Sunderland 3, Aston Villa 1. Jermain Defoe (Sunderland) right footed shot from the centre of the box to the top right corner. Assisted by Ola Toivonen. Attempt missed. Rudy Gestede (Aston Villa) right footed shot from the right side of the box is close, but misses to the right. Assisted by Libor Kozák. Substitution, Aston Villa. Scott Sinclair replaces Adama Traoré because of an injury. Substitution, Sunderland. Sebastián Coates replaces Adam Johnson. Offside, Aston Villa. Jordan Veretout tries a through ball, but Libor Kozák is caught offside. Carles Gil (Aston Villa) is shown the yellow card. Jermain Defoe (Sunderland) wins a free kick on the right wing. Attempt saved. Danny Graham (Sunderland) right footed shot from the centre of the box is saved in the bottom left corner. Assisted by Billy Jones with a headed pass. Attempt blocked. Yann M'Vila (Sunderland) right footed shot from outside the box is blocked. Assisted by Adam Johnson with a cross. Corner, Sunderland. Conceded by Leandro Bacuna. Foul by Libor Kozák (Aston Villa). Yann M'Vila (Sunderland) wins a free kick in the defensive half. Offside, Aston Villa. Rudy Gestede tries a through ball, but Libor Kozák is caught offside. Substitution, Sunderland. Ola Toivonen replaces Fabio Borini. Substitution, Aston Villa. Libor Kozák replaces Alan Hutton because of an injury. Rudy Gestede (Aston Villa) wins a free kick in the defensive half. Foul by John O'Shea (Sunderland). Goal! Sunderland 2, Aston Villa 1. Jermain Defoe (Sunderland) left footed shot from the left side of the box to the bottom left corner. Assisted by Adam Johnson. Adama Traoré (Aston Villa) is shown the yellow card for a bad foul. Foul by Adama Traoré (Aston Villa). Attempt blocked. John O'Shea (Sunderland) header from the centre of the box is blocked. Assisted by Adam Johnson with a cross. Corner, Sunderland. Conceded by Joleon Lescott. Goal! Sunderland 1, Aston Villa 1. Carles Gil (Aston Villa) left footed shot from the centre of the box to the high centre of the goal. Assisted by Adama Traoré with a cross. Attempt missed. Patrick van Aanholt (Sunderland) left footed shot from outside the box is close, but misses to the left. Assisted by Yann M'Vila. Attempt missed. Carles Gil (Aston Villa) left footed shot from outside the box misses to the left. Assisted by Rudy Gestede. Foul by Jermain Defoe (Sunderland).